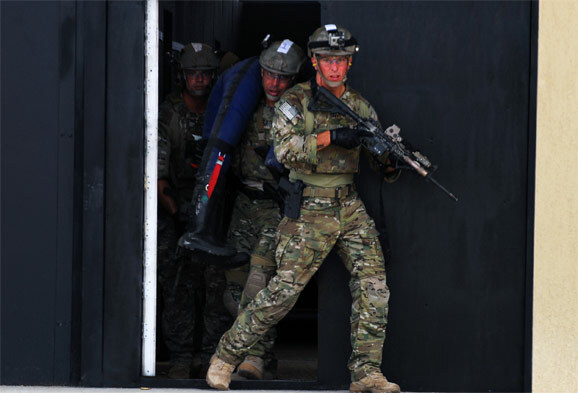 US Special Forces Command issues Solicitation for a Fire Resistant Combat Uniform. Soldier Modernisation wonders why? FREE Ensemble. Photo courtesy US Army. The Program Manager-Special Operations Forces Survival, Support & Equipment Systems office at the U.S. Army Soldier Research Development, and Engineering Center, Natick, MA is seeking combat uniforms for test and evaluation purposes. This uniform will consist of two garments; pants and combat shirt. Both will be produced with materials which provide fire resistant performance characteristics. All garments submitted to this solicitation will be reviewed and evaluated for operational efficacy. This uniform is intended for use by USSOCOM Operators, and as such must be effective in all operational environments, and be compatible with all Operator equipment. The project was completed in 10 months, a record time. The fire-resistant ghillie suit is now being fielded at the U.S. Army Sniper School at Fort Benning, Ga., at the U.S. Marine Corps Scout Sniper School at Marine Corps Base Quantico, Va., and at the Special Operations Target Interdiction Course at Fort Bragg, N.C.
Solider Systems was also responsible for testing and approving all FR clothing and materials currently in use by the Army and Marines. Theoretically, Program Managers from SOF SSES could just walk down the hall and have designers from Soldier Systems make them an FR version of the PCU Level 9! If none of these garments is suitable for SOF, and there really isn’t anything in the Solicitation that seems to indicate they would not be, as this author suggested, another option is to take the approved PCU level 9 uniform and have it made from one of the many FR materials Solider Systems has already approved. SOCOM has always been a branch of DoD that wants its “own gear,” and because of the nature of Special Operations, it usually gets what it wants. But in a time, where people across Capitol Hill and the Private Sector are concerned about waste and deep budget cuts, is it really such a good idea to put out RFIs for gear that already exists? Research Development and Engineering Center, Natick, MA.